We met over the Internet by sheer fate. 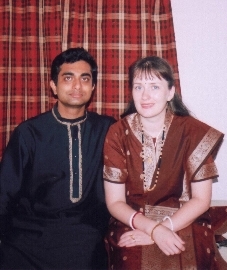 We never could imagine each other - one living in the Siberian city Krasnoyarsk and another in Calcutta, India – getting married one day. It all happened like a fairy tale. Tanya (Tatiana Popova) was born on 15th of December 1976 in the city of Kemerovo, Russia. Then her family moved to Krasnoyarsk where she finished her studies (starting with the average school #41, followed by the faculty of Arts and Cultural Studies in Krasnoyarsk State University, and finally doing post-graduate research in the department of Philosophy in Siberian State Technological University). Her main interests are arts, philosophy, translation and travelling. Neel (Nirupam Biswas) was born on 24th of July 1975 in a small township, Hoshangabad, in the heart of the central state of India, Madhya Pradesh. Since his childhood, he was prone to creativeness. He finished his schooling from Kendriya Vidyalaya, Hoshangabad. Then he moved to Calcutta for higher studies. After graduating with majors in Physics at St. Xavier’s College, Calcutta, he took on a Graduate Diploma Course in Systems Management where he had his first taste of computers. He finally became a Database Administrator in a software company and presently works in Calcutta. His main interests are writing, sketching, listening to music and singing. He also loves to travel.